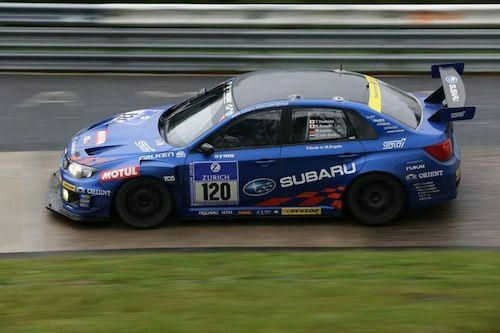 The 2013 Subaru WRX STI team entered the Nurburgring 24-Hour Race fully expecting to win for the third year in a row but two critical factors kept them in 2nd place behind the Audi TT RS 2.0. Subaru Tecnica International Inc. (STI) entered the Nürburgring 24-Hour Race this week with the racing version of its Subaru WRX STI in the SP3T class fully expecting to walk away with their third win in a row. The race took place from Friday May 17 to Monday of this week in the Ahrweiler district of Germany with the WRX STI finishing 26th overall and 2nd in class in the sub-2-liter turbo-charged vehicle class. What happened to the STI team that kept them from finishing first again? The 2013 Subaru WRX STI Started the race from 2nd position and was involved in a heavy head to head battle with Raeder Motorsport and the Audi TT RS 2.0, the winner of the qualifying. The weather was mild for the final race, but deteriorated rapidly as the race went on. Officials had to suspend the race at 11:00 pm due to heavy rain and fog. The weather improved the next morning, and the race finally resumed after dawn at around 8:00 am. The rain continued, however, and teams struggled to find the right tire choices. The 2013 WRX STI race car was reworked for the race and featured a larger underspoiler up front to restrict front lift. New overfenders around the rear tire-housing and a defuser were added on the rear underbody to improve aerodynamics. Other improvements include moving the fuel tank to improve weight balance, and BBS forged magnesium wheels have been used to reduce the unsprung weight of the 24-hour Nurburgring race car. The improvements were made to increase speeds on the fast corners at the Nurburgring. The team was fully ready to win. The changes produced impressive results in testing leading up to the race. After the race was restarted, conditions turned even worse with rain and the WRX STI “couldn't pick up the pace” and allowed the Audi TT RS to get away. Subaru STI drivers, Toshihiro Yoshida, Kota Sasaki, Carlo van Dam, and Marcel Lasee kept pushing to close the gap. And in the last half of the race, the team decided to take a chance where almost the entire track had dried except for the Grand Prix track. The 2WD Audi TT RS was on tires with shallow grooves, but the STI team made the decision to run on slick rubbers to reduce the gap, counting on the exceptional stability of the WRX STI. The decision was a good one as the AWD WRX STI was able to close the gap. As a result, the 7-minute gap when the race had 3 more hours to go was dramatically reduced to 54 seconds by the final lap. However, there was not enough time to catch the Raeder Motorsport team and the Subaru STI team finished 2nd in the class. The 2013 Subaru WRX STI team was disappointed after the 2nd place finish and not being able to win for the 3rd time in a row. The competition was fierce for the Japanese team against its global competitors.